Here's we've seen an highly off road exploration vehicle was offered in craigslist for $49500 located in Bel Air, Los Angeles, California. 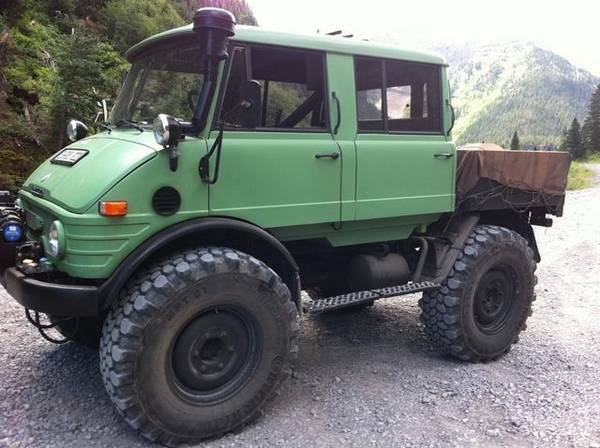 As shown here is a Unimog 406 DoKa U900, is a crew cab 4x4 all terrain truck built in 1975 by the Germany automaker Mercedes-Benz. 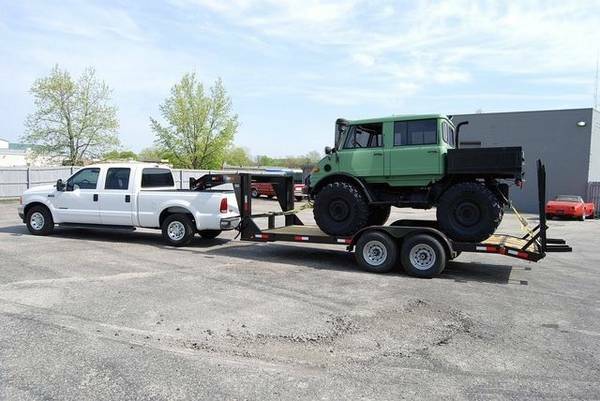 The seller says is original truck VIN: 40614510026173 60 powered by diesel engine mated with manual transmission has been driven about 88000 miles and is said still in excellent condition, this could be a perfect toy or more valuable as the offroad camper. And remember the Unimog is not so fast than your car but it more quicker than a tractor, so don't push him overtake a Ferrari on the highway except in the desert or mud. 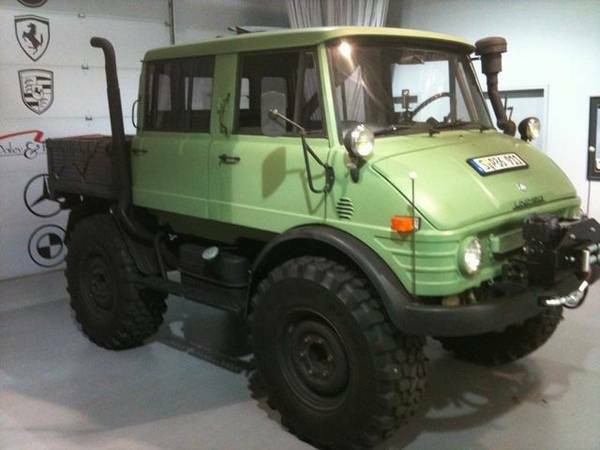 1975 Mercedes-Benz Unimog 406 DoKa U900 Offroad Exploration Vehicle Awesome Condition 1975 Mercedes-Benz Unimog 406 DoKa Unimog DoKa 406 U900 4-Door SUV Exterior Color: Green Interior Color: Green Stock Number:026173 Mileage:88,000 Engine:5.7 Diesel Fuel:Diesel Transmission:6 Speed Manual Warranty:As Is - No Warranty Title:Clear VIN:40614510026173 60 Up for sale is my personal 1975 Mercedes-Benz Unimog 406 DoKa. This awesome 4X4 is a true go anywhere do anything ultimate Offroad and trail ready exploration vehicle. 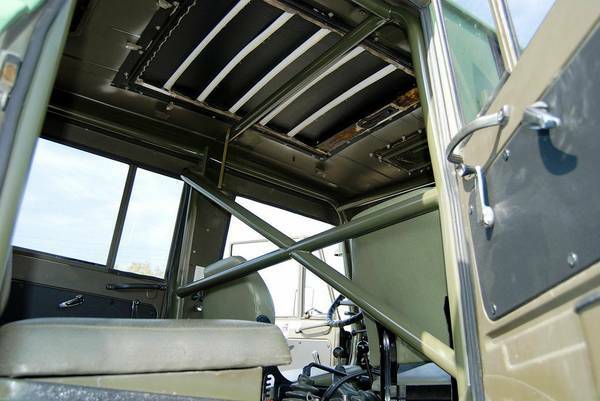 It is fully licensed and street or trail ready for anything you can throw at it. It is fully sorted out and just fully serviced. 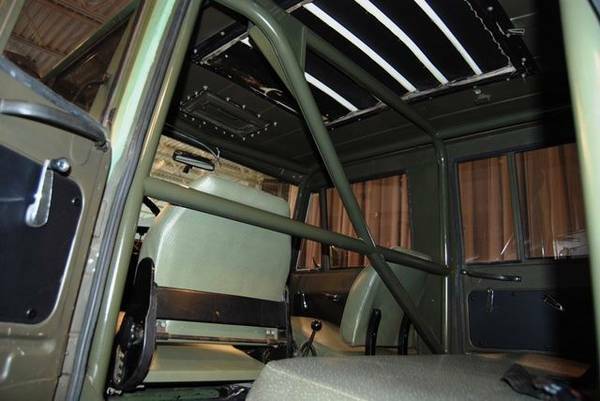 It is a true four wheel drive vehicle with front and rear lockers and shift on the fly capability from 2WD to 4WD. This one has lots of extras. It is powered by the tried and true 5.7 liter OM352 direct injected Mercedes diesel engine producing about 110hp in current state of tune. It weighs in at 8,900 pounds in it's current road ready state according to the local CAT scale. It features a 6 speed forward manual transmission with a unique 2 speed low range 4 speed high range and 2 speed low range in reverse arrangement with rare torque converter option. It is entirely possible to drive off from a stoplight in 6th gear without shifting albeit at a very slow rate. It is typically driven off from a dead stop in 3rd gear and shifted through gears into 6th for cruising speeds up to its top highway speed of about 52mph. The unique torque converter option comes in really handy when offloading since climbing steep trails will not induce stalling. This unique arrangement was used by Mercedes when designing this particular Unimog model for duty as an aircraft tug. This awesome example of one of the toughest off road vehicles ever made was first commissioned by the German military as a Jumbo Jet tug so it was never subjected to salt or corrosive environments and is entirely rust free (a rarity among this these beasts. It ha been estimated that just over 350 of the "flugzeugschlepper"aircraft tugs with crew car "DoKa" bodies and torque converter manual transmissions were ever built. You could say this arrangement is the best of both the automatic and manual transmission worlds. as laid out in this arrangement these tugs were capable of towing any type of aircraft including the giant 747 jumbo jets safely to and from the airstrip from hanger and take the crew with it. particularly handy in difficult terrain situations and bad weather. After retirement from active service my Unimog was ifully reconditioned by Classic Unimogs in Germany and imported to the USA in late 2001 by an individual in western Colorado where it had the opportunity to have fun on the rugged trails in western Colorado and Eastern Utah. In late 2007 the Mog was sold to a collector in suburban Boston where it spent the next year tucked away in dry storage and used very little.